Welcome to the doors that will welcome you home. Whether you’re building a new home or re-imagining an existing one, Ply Gem has the patio door for you. With innovative designs, inspiring colors and advanced materials, our swinging or sliding patio doors will open a world of possibilities for your home. Grasp the handle, open your door and take comfort in knowing you made the right decision. Open your home to sunlight and fresh air with a Ply Gem patio door. Providing a gateway from your inside living area to the outside, patio doors deliver a wide open view. 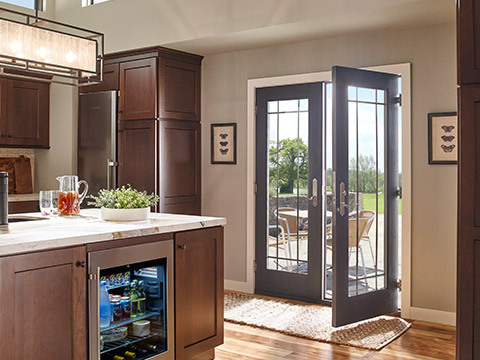 Browse our collection of door styles including sliding patio doors and hinged, swinging patio doors to discover the perfect door for you and your home. Why do we offer doors in different materials? Because we believe patio doors should be uniquely designed to deliver the best performance for where and how you live. Discover the distinct benefits of vinyl, aluminum clad, wood composite and aluminum doors to find your home’s perfect fit. Explore the possibilities with patio doors designed exclusively for new homes. Discover the door replacement series that will make your remodel complete.